I WOULD like to thank Lyndon Joseph and the workers from the county council for getting the potholes filled in at Ferry Lane as I requested. It is remarkable, given the time sequence, that this has been done so quickly and the fact that people are cycling through towards the Recreation Ground, where we are still waiting for the lights to illuminate the cycle track in Croft Road Rec’. I WAS walking through Croft Road Recreation Ground on Sunday, February 9, when I saw some youngsters having a football training session on the field. What surprised me was that they had to bring their own portable goal posts with them – we only have one goal post on this field. We did have two, but, unfortunately, the other one was taken out by the councillor in charge at the time. The excuse she made was that it was being taken away to be cleaned. The goal post has never been replaced. I have repeatedly asked for another one but, to my dismay, it hasn’t happened. I noticed by a photograph (January 13) that the Labour Party used to have a football team playing there. I am very pleased that they used the ground with both goal-posts available. I’m sure if we had the other goal post replaced, then youngsters who wanted to play football on the field could do so – especially as it’s quoted by a certain Labour councillor that doing sports is important. TESCO has promised it will not move a plaque and bench in memory of war dead as part of its plans to convert a closed pub. The firm considered moving the plaque to make way for a car park to the front of the Friar pub – closed for six years – in Marston Road. 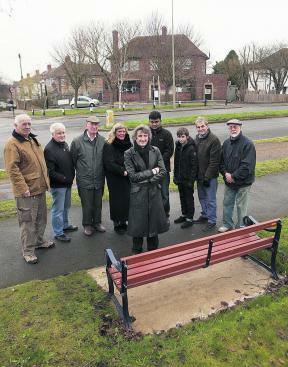 And residents were concerned the plan for a Tesco Express would also see the bench moved. Both remember the 27 men from Marston who were killed during the conflict. Tesco spokeswoman Beth Greenhouse said: “The memorial plaque and bench will be remaining where they are. “We’re pleased that this is the case and hope residents now feel reassured. The news was welcomed by Oxford City Council member for Marston Mick Haines, who paid for the bench and plaque. Tesco got planning permission to convert the former pub in 2011, despite strong local opposition. It aims to start work next month and says the store, due to open in the summer, will create 20 jobs. RE: Community News, Marston and Northway (December 19) containing the article about Tesco’s intention to start work converting the Old Friar pub into an Express store in February 2014. I was surprised to read the remarks made by Councillor Altaf-Khan over his concerns regarding the impact a Tesco’s Express will have on the other small shops. What a pity he and his ilk didn’t shout loud enough at the time of objections to the planning consent at the meetings at the Town Hall. Councillor Mick Haines, who at the time was unelected, fought a tremendous battle to try to stop Tesco. A spokeswoman for Tesco said that their new shop will bring more footfall to the area (where from remains to be seen) and would benefit the other shops and give more choice to residents. That may be so, but if people are using Tesco then the other shops will be losing trade and if, say, Costcutters were unable to survive, then we would lose the much-used post office. The spokeswoman goes on to say that they will be relocating the memorial plaque which is there to honour the 27 men from Marston who were killed in the Second World War, as part of the work to the new store. The plaque is on the other side of the Marston Road on a much-loved green area with several trees. Is there an intention to make this area a parking area for Tesco? I trust that county councillor Mark Lygo will be objecting to any alteration to this area. I know Councillor Mick Haines will be. Come on all you local councillors, stop this happening. The people who you are supposed to represent do not want this area spoiled. I read with interest about the signs that have been installed in Parry Close, Marston (September 20), which Councillor Mick Haines among others campaigned for, to stop cyclists riding on the footpath and causing potential accidents with pedestrians who use this route on a regular basis. I applaud Councillor Haines’ successful campaign and I understand from him that they are legal signs, which cyclists are expected to obey. However, if these signs can be installed in Parry Close, why can’t Oxfordshire County Council do the same at the entrances to the Headington roundabout subways which I have for a long time been campaigning for prohibitory signs to be put there. 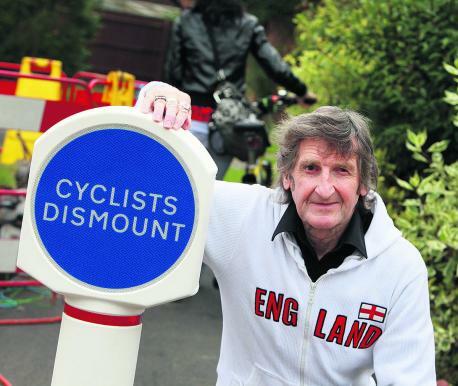 Currently there are blue advisory signs asking cyclists to dismount, which very few actually respond to and some race through without care, causing a hazard to pedestrians. Given the small confined space in the subways, I feel that an accident is much more likely to occur than if a cyclist rode carelessly above ground. So I am hoping now that Oxfordshire County Council will see sense and finally put legal signs there which will allow the police to address the problem, which they currently have no control of. 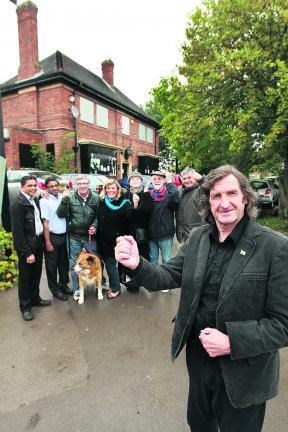 WORK will start on turning a former pub in Marston into a Tesco Express store in February. The company hopes to open the new shop in The Friar, Old Marston Road, next summer and says it will create 20 jobs for the area. The property has been empty for more than six years and has previously been described by residents as an “eyesore”. 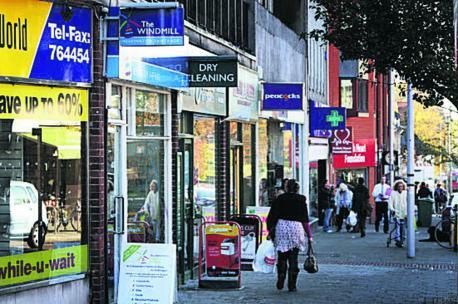 But the plan has proved controversial with local councillors, who fear it could impact on other shops and cause traffic problems in the area. Mohammed Altaf-Khan, Oxford City Council member for Headington Hill and Northway, said: “I am not objecting to the 20 jobs. “But my concern is the impact on the small shops nearby, and transport issues of cars parking there and trying to get in and out. The Tesco store would sit on the same road as a Costcutter store, which includes a post office and a Co-op store. City council representative for Marston, Mick Haines, said: “I think it is terrible, and I have got two real big worries. “Number one is that there is a memorial bench and plaque on the side of the road where they want to put a small car park. “My other concern is the impact on the post office in Costcutter. I went to Downing Street to save that post office in 2006 with 1,200-odd signatures. The £1,500 memorial bench was put on the green space in March 2013 to honour the 27 men from the parish who were killed during the Second World War. The £500 plaque was put up in October 2012. Money for both the bench and the plaque came from Mr Haines’s city council community grant fund. Tesco has had planning permission to convert the former pub into an Express store since 2011. A spokeswoman for the company said: “We’re pleased to be bringing forward our plans for our Express store and hope to start on site in February with a view to opening in the summer. Our new store will provide 20 jobs for local people. She said that in the company’s experience Express stores brought more footfall to the area, which would benefit other stores and give more choice to residents. PEACOCKS has been one of the most popular shops in Headington for many years. It is now closing and being pushed out by yet another multi-national supermarket. Is this the way forward? If so, where is it all going to end? I CANNOT believe that after all this time Tesco’s has decided to start work on the Friar pub in Marston. I have been informed that work will commence in February, ready for an August opening. I have two issues that really concern me. The first one is the plan for the car park on the site where the memorial plaque and bench are situated (which has been recognised by the Oxford Preservation Trust). Also, the local post office in Costcutters. I went to Downing Street in 2006 to save it. Surely, it is now time to stop these multinational supermarkets from pushing out the local retailers who have supported the local communities for many years. A total of 2,831 signatures were signed on a petition against the Tesco’s application by the majority but this has been ignored. Once more, democracy doesn’t seem to count. THE East Oxford Area Planning Committee meeting (September 24) regarding outline planning permission for the Barton build was a sham. Murray Hancock (Oxford city officer) informed councillors that the meeting was too short notice for Thames Water to attend. They were not coming and were confident of a satisfactory solution. In fact, Thames Water has failed to provide any evidence of its sewage disposal provision suggested operating successfully anywhere. About 2,500 people are expected to reside on the development, despite councillors Mick Haines (Marston Independent), David Williams (Green), Michael Gotch (Lib Dem), Ruth Wilkinson (Lib Dem) and Mary Clarkson (Lab) raising concerns including investigating ground contamination before granting permission. Thames Water, a private company, apparently isn’t due to investigate until 2020. Convenient, as the build is due from 2015 until 2019. Colin Cook announced: “People who move into new developments buy more cars.” Obvious, because people have to squeeze more bodies into properties to be able to reside in Oxford – hence the appearance of more cars. Simple. Outline planning permission was swiftly granted, ignoring councillors. David Williams abstained regarding unsatisfactory assurances. How can councillors’ votes be legally binding as the meeting no detailed minutes were scribed, and requests to film or record the meeting were rejected. NEW signs telling cyclists to get off their bikes on a hazardous footpath have gone up after a long campaign. The signs have been put up in Parry Close, Marston, after a series of incidents where pedestrians have been struck by bikes or cyclists coming out of the lane have almost collided with cars. Oxford city councillor for Marston Mick Haines said he was “over the moon” over the installation of permanent signs – erected after temporary ones were ripped down. The path has long been a source of contention for residents and on July 19 the Oxford Mail reported how councillors had suggested introducing more bollards to tackle the problem. But that idea was rejected at a meeting between councillors and Steve Axtell, senior traffic technician from Oxfordshire County Council, and Oliver Hearn, from Oxford City Council highways and engineering. It was feared that people in wheelchairs or with pushchairs would not be able to get through if there were more bollards. Temporary signs were installed but they were then vandalised and pulled down. The narrow track has been criticised by residents as dangerous. And they feared the problem would get worse after the £157,000 cycle path linking Marston with the city centre was completed. Mr Haines said that a year ago a man from Hugh Allen Crescent, which runs next to the path, was hit by a cyclist and needed 15 stitches in his arm. John Maguire, 55, said the situation was “crazy” and his neighbour had almost run over two cyclists because he could not see them. He welcomed the new signs and said: “My neighbour Liz did a survey for an hour in the morning and 114 people cycled down the path. But Mr Maguire said the sign at the Purcell Road end of the footpath may be too high for cyclists to see, at about 7ft. Oxfordshire County Council spokesman Marcus Mabberley said a new bollard at the Parry Close end and a sign at the Purcell Road end had been installed after requests from the community, at a cost of about £550.